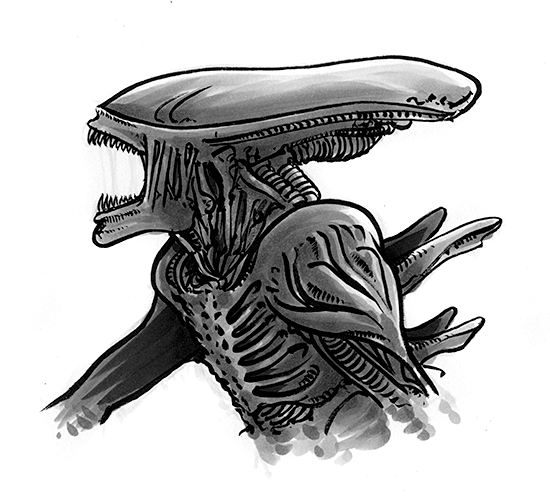 …still having a blast drawing Aliens. I created this one while drawing with Chloe the other night. It was roughed using a Copic Sketch N0, inked with a brush pen, and shaded with a N2, N4, and N6. From a deliverable stand point it’s worth looking into “JPEG MIni” if you haven’t already. It crunchifies JPG files down further with zero loss. I had heart-eyes for this app after having it drop a group of JPG’s from 21MB to 4MB. Anyhow, here’s some proof. Dig the algorithm.